You have built the world greatest app and you have published it on the Store. Now it is time to start market your application, time to show to the whole world how great is your app. Talking videos are a very rapid and effective way to provide an overview or a tutorial for your app. With SlideTalk you do not need to set up a big project or use a microphone to create a talking video, you only need to capture pictures (for instance screenshots or scenarios) and provide a text script. SlideTalk will convert the script into an automatic voice-over, and it will add the music that you choose and publish the video on YouTube for you, ready to be shared online. This is a straightforward and efficient way to promote your app. 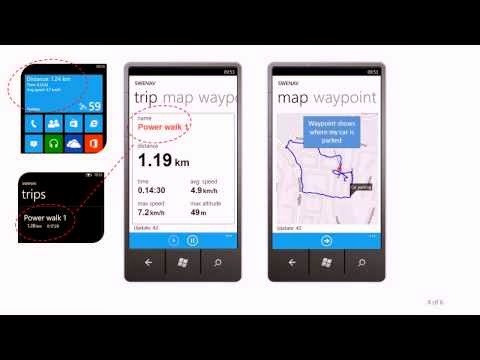 Here you can watch an example of a promotional talking video for a Windows Phone app created using SlideTalk. Download and edit this PowerPoint template file. Then edit it by replacing the framed images with your own screenshots and modifying the text and comments for each slide. Login to SlideTalk or create a new account using the "Log In" link here above. Each user gets the possibility to publish 6 SlideTalk videos for free. Create a new SlideTalk video and choose upload of your edited PowerPoint file. Edit, preview and produce your SlideTalk video. The SlideTalk video is automatically published and ready to be shared. Click here for a short but comprehensive tutorial on how to create talking videos with SlideTalk. Have a look at this playlist created with SlideTalk, and learn to count in English, Spanish, French, German, Italian, Polish and Swedish! 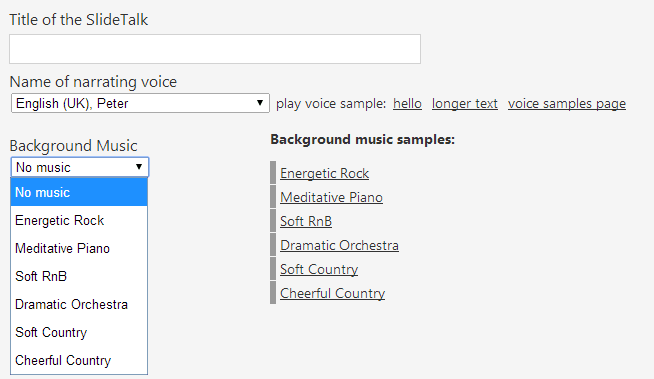 Make your talking videos even more engaging and entertaining by adding music moods.